Rent a Maserati in Miami for a weekend or just for one day. Maserati combines elegance and performance in one package. 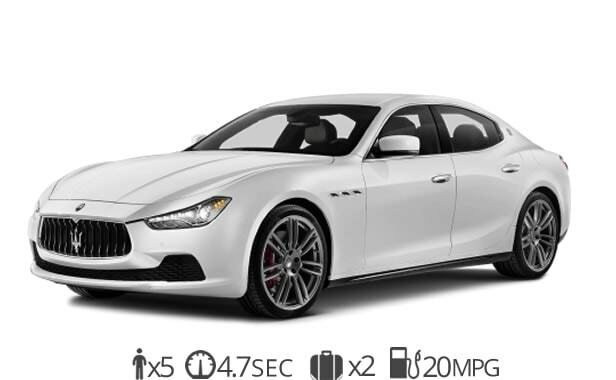 Equipped with a racing DNA the Maserati Ghibli is one of the more popular Maserati rentals in Miami. Maserati emphasizes luxury, elegance and bold design. If you’ve ever considered luxury car rental in Miami then a Maserati is a great option. Our Maserati rental service comes with FREE delivery to (MIA) Miami International Airport. We also provide several delivery options to Miami Beach, South Beach, Brickell, Wynwood, Midtown, Downtown, Doral, or anywhere in South Florida. Our Maserati Ghibli rental services provide a luxury sedan that’s perfect for any weekend getaway. The iconic front grill and sleek sporty Italian design make it a top choice for business executives and families. The Ghibli is an affordable luxury car rental that provides an opulent interior and comfortable seats. The cabin is composed of hand-crafted luxury finishes and the finest Italian craftsmanship. An Italian luxury sedan that will leave you breathless. Get free delivery to MIA Airport as well as Doral, Brickell, Downtown, Wynwood, Miami Beach and South Beach. We can deliver this beautiful luxury sedan to your hotel, business or residence today! Ready to rent a Masearti in Miami?